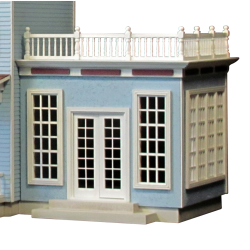 This Foxhall Manor dollhouse kit is a beautiful mansion with a magnificent center hall an elegant curved staircase with a stunning third-floor landing. This dollhouse has two beautiful skylights, a Palladian dormer window for the center hall that keeps the third floor open and bright. it also has partial front-opening access for more play room. This is our last Foxhall Manor kit as it's now discontinued. Complete Kit includes everything you need to finish except paint, glue, and furnishings. The New England Conservatory can be added to the Foxhall Manor. The two-story addition is no longer available.